For a child, going through a maze may be one of the joys of life, but why not spice it up with upbeat techno music and flashing colours? 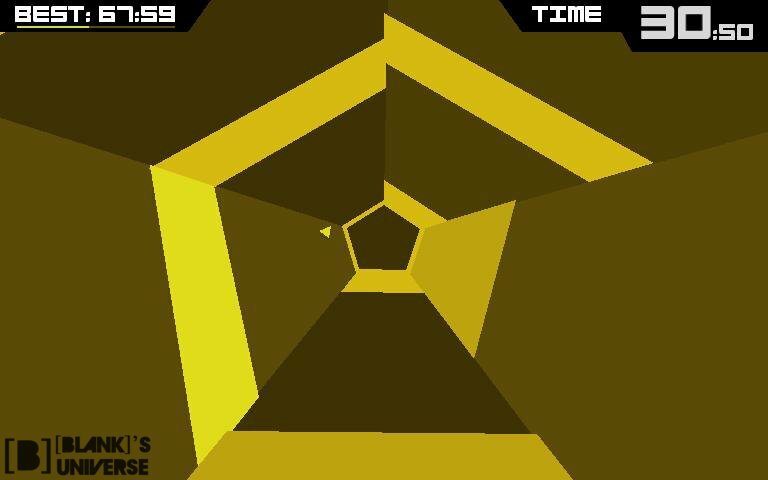 The creator of “VVVVVV”, Terry Cavanagh, took that idea and created the game Super Hexagon. This is a truly amazing game, but if you’re worried that it won’t run on your device, don’t fret, this game is available on virtually all platforms. There are 6 levels in this game ranging from hexagon to hyper hexagonest. These levels start from hard on hexagon and increase in difficulty as you progress. Also, in the normal (non-hyper) levels, when a full minute is reached, it will automatically unlock its hyper sibling. Hyper modes in Super Hexagon are faster and more difficult versions of the normal modes and new obstacle patterns may be introduced. After playing through Hexagon, you might be wondering how to survive anything even harder. Well, it might seem like the walls come in random order, but it actually comes in at a pattern form so it can be memorized. The only way to beat a level in Super Hexagon is to last a full minute or longer without coming in contact with any walls. Other than the 6 main levels, there are also sublevels within each one. There are 6 sublevels in each level ranging from point, which is the sublevel you start off at, to hexagon at 1 minute. With each sublevel, the game gets harder, sometimes by the introduction of a new concept. In Hexagon, with the introduction of the Line sublevel, the center hexagon will rotate more aggressively in random directions. After reaching Triangle, the center hexagon may morph into a pentagon or a square. 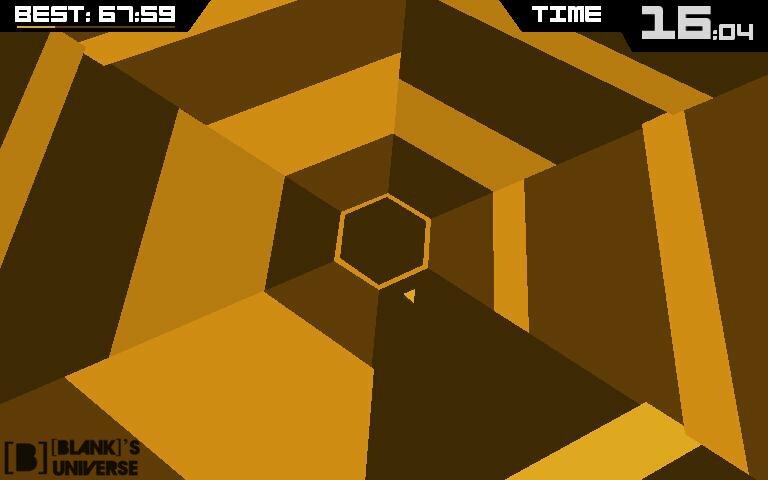 Graphics in Super Hexagon are very impressive. Combining simple effects, such as a colour changing background and polygon, create a simple yet surprisingly effective visual experience. It provides a clean visual for the user but also uses captivating colours to enhance the gameplay. The good thing about these simple graphics is that it does not distract the player from gameplay. Super Hexagon features an upbeat 8-bit techno track by Chipzel that really compliments the game. With its driving tempo, it creates the feeling that fast movements need to be used to survive in this game. The central polygon pulses to the beat of the techno track and that really helps a lot when trying to complete the level. 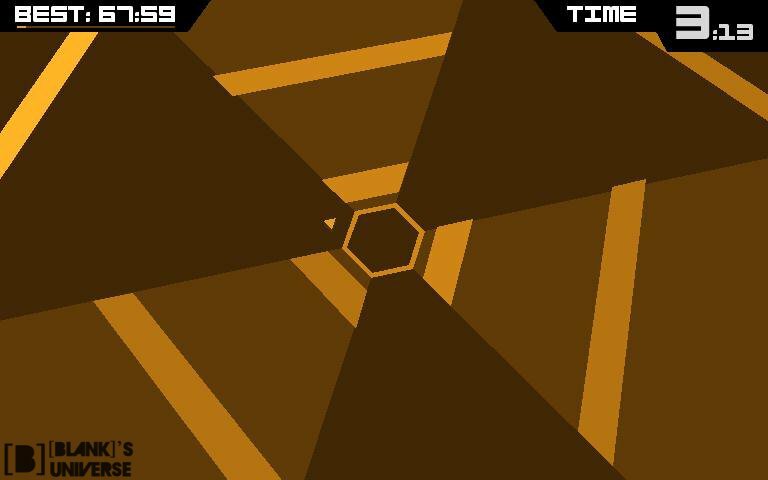 Super Hexagon is a pretty good game that uses requires both mental thought and hand-eye coordination. Super Hexagon seems to be very hard at first but with more and more experience, it gets easier and easier. I guess practice does make perfect. I also found Super Hexagon to be very addicting because there is a lot of motivation to set a new high score. Ideas can come from anywhere and anytime; Super Hexagon clearly is one of these ideas. Despite its surprisingly simple concept and graphics, it truly captures players from across the spectrum. Hell, it even attracts people who don’t even game! Combine that with an extremely fitting soundtrack and you’ve got more replay value than most AAA titles. While many gamers believe that an enchanting story or graphics are a necessity for any successful game, Super Hexagon completely destroys that idea. Turns out that all you need are the basics. You can get Super Hexagon from the Google Play Store, Apple App Store, Blackberry App World (For BB10 only), and on Steam.